This line of images caters to those who would like to create greeting cards for someone with a special talent. Do you know someone who's a dancer, a painter or a musician or who has a special talent that you'd like to acknowledge? This is a great way to say thank you to a participant in a school concert or a local art show. Select the card of your choice and add your own special greeting. It's so easy and so satisfying and it shows that you've got your own special talent and thoughtfulness when you create greeting cards. A colorful palette on a contrasting background makes a graphic artistic statement. 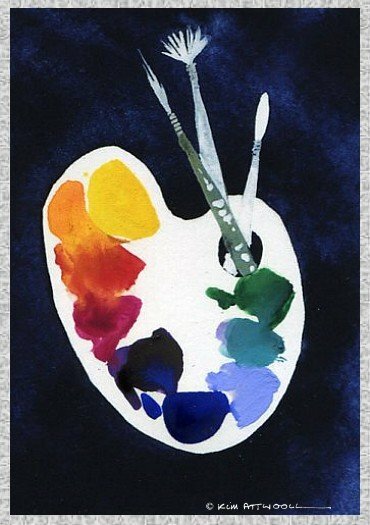 This is great fun to enhance with puddles of color placed onto the palette. Frame it for your studio or share it with a fellow artist. 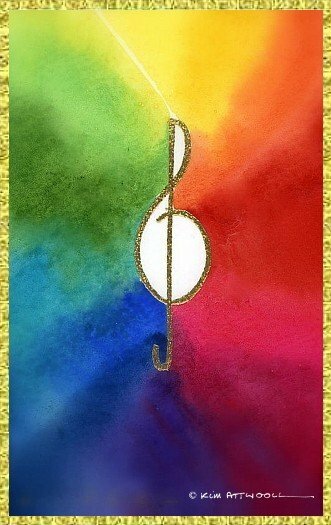 Music lovers will delight in this Treble Clef image painted on the color spectrum. It symbolizes the all encompassing properties of sounds from symphonies through jazz to blues and beyond. This colorful image says a lot, just like you can when you send it!